Grande y poderoso. Al final del camino nos espera, un mundo magno y esplendoroso para expandirnos por todo lo ancho y demostrar al mundo cuan bello es muestro interior y exterior. Seamos como el Mar, que hasta en los días grises y nublados sabe reflejar y expresar todo lo que tiene en su interior. 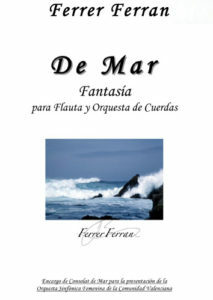 Partitura bella, fluida y con sentimiento, refleja el bailar de las olas, el movimiento del alma interno que irradia un mundo espiritual interior. La grandeza del mar, el secreto del universo, el principio sin fin…, Como se podría describir esta lejanía infinita y esta maravillosa creación…, “De Mar” estamos hablando. Esta Composición está dedicada a Magdalena, una flautista universal, tota una artista d’anima plena i impuls coral! Obra encargada por Consolat de Mar para la presentación de la Orquesta Sinfónica Femenina de la Comunidad Valenciana. Su estreno fue el día 28 de Octubre de 2009 en el Palau de la Música de Valencia por la Orquesta Sinfónica Femenina de la Comunidad Valenciana, siendo la solista a la flauta Magdalena Martínez y Manuel Bonachera el director. Large and powerful. At the end of the road we expected a grand and glorious world for us to expand across the width and show the world how beautiful it is inside and outside show. Let us be like the sea, that even in the gray and cloudy days knows to reflect and express what you have inside. Beautiful, smooth and feeling score reflects the dance of the waves, the motion of the inner soul that radiates an inner spiritual world. The greatness of the sea, the secret of the universe, the endless beginning … As you might describe this infinite distance and this wonderful creation …, “Sea” are talking about. This composition is dedicated… Magdalena, universal flautist, tota d’encourages an artist full coral i impuls! Work commissioned by the Consulate of the Sea for the presentation of the Women’s Symphony Orchestra of Valencia. 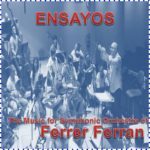 Its premiere was on October 28, 2009 at the Palau de la Música in Valencia for Women Symphony Orchestra of Valencia, be the soloist on flute Magdalena Martinez and Manuel Bonachera director.